In my recent post I wrote about how to build and run unit tests on Android project from command line. These were first steps to setup Continuous Integration for your project, and now I’ll show you how to automate a build with Jenkins. First of all, you’ll need Jenkins CI server installed on your build server (in BlackRiver, we are using Windows Server virtual box for Jenkins main server). Since we are going to build Android project on CI server, we’ll need Android SDK (don’t forget to install appropriate SDK version using SDK Manager!) and Android Emulator Plugin for Jenkins. Also, you’ll probably need to integrate Jenkins with your version control system, we are using a Git Plugin for that. Step 3. Checkout code from Version Control. Open newly created Job and go to its Configure screen, locate Source Code Management section and enter required paths and credentials. I’m using Git and github, so I’ve checked Git radio button and entered URL from github: http://username:password@github.com/PATH_TO_YOUR_REPO.git. Note: It is a good idea not to paste your own username and password in Jekniks, just create new user, which has access only to this project repository. Now, you can apply changes and Jenkins will have access to your repository: just click on Build Now link, you’ll see that your project is being build (at the bottom of left sidebar you’ll notice the link to current Build). Open Console output to review the detailed log. Alright, now we have the source code checked out from our version control repository, it is time to build the project! Step 4. Configure Jenkins to build project with ANT. Go to configure screen in your Jenkins job and locate section called Build. Click on “Add build step” dropdown located at the bottom of the section and pick the item called Invoke Ant : new build step will be added to the Build section. Make sure you’ve provided correct Ant settings in Jenkins system configuration and select Ant installation from dropdown in Invoke Ant build step. This will build debug version of you app. Time to check if we made everything right: hit Build now link and wait while your project is being built by Jenkins. and now Ant will find build file. Step 5. Run android emulator to run tests on. Jenkins is able to manage AVDs (Android Virtual Devices) which you can use to run unit test, functional tests or other kind of tasks. 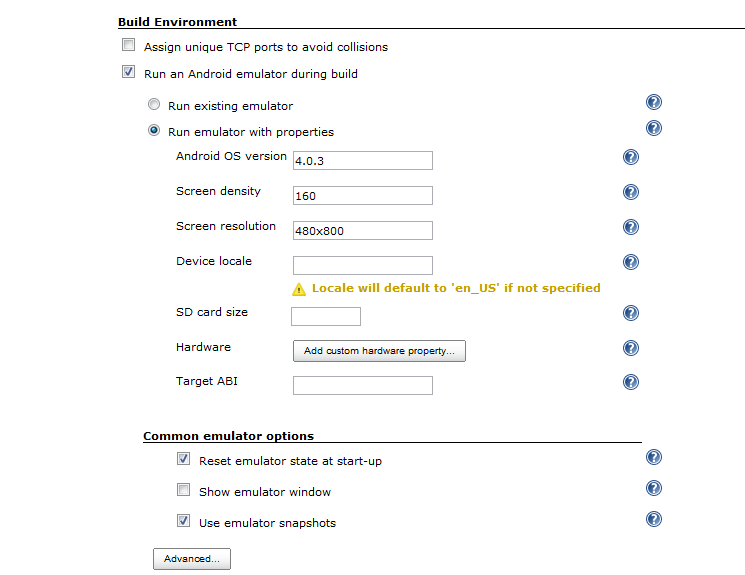 Android Emulator Plugin for Jenkins provides easy to use interface which can be used in Jenkins build job. I’ll show you how to run emulator during Jenkins build, how to run unit tests (JUnit) and how to calculate code coverage. Note: if you don’t have any downloaded Android SDKs, Jenkins will download and install them for you, just check Console Output while running the Job for details. It may take a while for Android SDK to be downloaded and installed, though, but it is the SDK manager issue. This time I’ll skip functional testing, but I’ll cover that topic in my future articles. and if Jenkins won’t find build.xml, don’t forget point to it on the Advanced section of the build step, just like we did while we were building the main app. Save and build your project, it will take much longer than simple compilation – open the Console output screen to see what is happening. I hope that you build went well, compilation succeeded and all the tests passed. But it is rather uncomfortable to scan through the Console output screen to see if tests passed or build succeeded, isn’t it? Step 6. 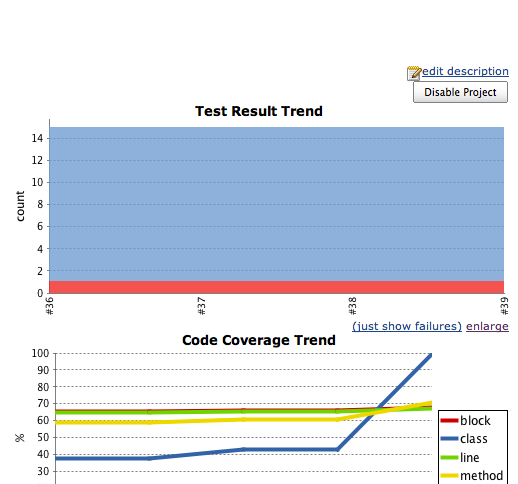 Publish JUnit and Emma code coverage reports. Before we started with Jenkins configuration, I should show you a little trick. As you may already know, Android JUnit tests are executed on the device or emulator and the sad thing is that JUnit stores its reports on the device, which means Jenkins is not able to grab them and build a report for you. Now we have all required reports to publish. One tiny detail left: you probably want to be notified when the build is ready, Jenkins can handle this job pretty well, just add post build action called E-mail Notification. This action will be triggered when the build is finished (regardless of result) and recipients listed in corresponding field will receive an email about recent build. You can set up more complex notification system with the Email-ext plugin for Jenkins. Time to finish this pretty long article, thank you for reading! Next time I’ll show you how do we maintain development, QA and production processes with Jenkins. Can you please provide update about plans for next article? The new article will be posted soon. Where do I put that Ant task code on Step 6. 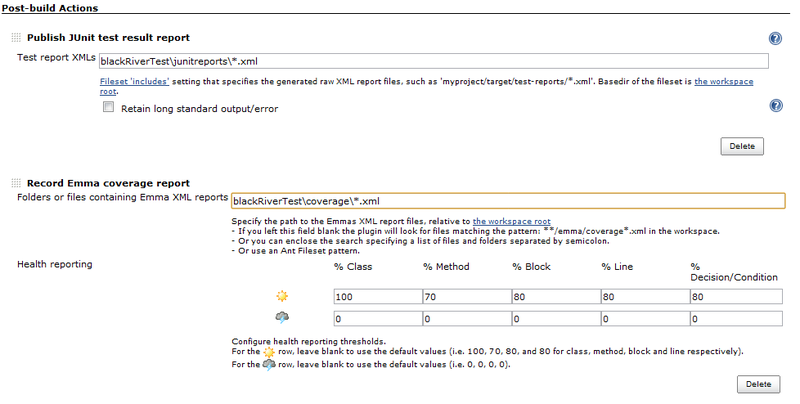 Publish JUnit and Emma code coverage reports.?? You should put the “fetch-test-report” task described in step 6 to the same build step as “test” ant task. Do I add the “ant task” specified in Step #6 in the build.xml of the main project or the test project? First of all, thank you for the great tutorial. I was able to follow your tutorial until step 5: the project can be built, deployed to device or emulator and tested successfully. But i am stucked within step 6. Could you please have a look at my build.xml, located here? Thanks for your article, I am trying to setup the jenkins for our android projects as well, when I use a device and run “all clean debug install test fetch-test-report” it works fine. but it fails when I use an emulator. I was wondering if anyone has came across this issue. please, have a look at my comment below. are you sure that the default android test classes generate a test report in a XML file located at /data/data/project_name/files/junit-testreport.xml ? I also tested it manually and pulled completly /data/data and it seems that it doesn’t generate a directory for the project. So I don’t get a junit report, too. On this website (http://www.alittlemadness.com/2010/07/14/android-testing-xml-reports-for-continuous-integration/) I read about a custom class which generate the report file. Did you take this from there or are you sure that default android classes do this too? I should have mentioned it in the article, we use approach taken from https://github.com/jsankey/android-junit-report , actually it is same as in the article from your comment. when i copied the ant task from your example, all ” were substituted by ” in Eclipse, so it was just a syntax error. I got it working and the JUnit file is generated now and can be fetched by ADB. One problem I still have is, that the Emma reporting does not work. There is no folder created called “coverage”. Do I have to do anything else then having the argument “emma” in the ant command? Do I have to put anything emma-related in my build.xml? The project builds and runs on emulator. But all test cases are failing? Though they pass in local environment. Do you have any idea? Is emulator needs to be unlocked manually? Should we have one Jenkins job which includes both the app and test projects or one ‘app’ job and one ‘test’ job which follow on from each other? If one job should we tell it to use the test project’s build.xml and expect that to build the app project via Android’s ant’s dependencies? I guess this also assumes you have both projects in one git repo as the job’s git SCM options don’t let you specify a target directory. If separate jobs how do we get the test job to reference the built output from the app job? If both projects are included in the git clone it’ll rebuild the app project again, wasting the time spent on the first build. Also need to reference the classes if there are junit tests. Great articles thanks, very helpful! if build.xml is not found in the workspace what should i do?